Welcome to the LendLedger Bounty Campaign Thread. To join the LendLedger Feedback/Advocate program and receive rewards, you must have an active Stellar-compliant wallet. A Stellar-compliant wallet supports the native asset of the Stellar network - XLM - as well as other Stellar-compliant tokens. To make this sweeter and help activate your Stellar wallet, we’re offering everyone who participates in our campaign 5 XLM for free to activate the wallet- We'll send you 5XLM at the end of the bounty- Only if you respond back to our email which we'll send you. LendLedger​ is the first open network on Blockchain solving trillion-dollar lending gaps. The LendLedger Network brings together Borrowers, Lenders, and Data Providers in an open and accessible global ecosystem providing credit evaluation and borrowing opportunities to those who have been neglected by traditional lending services. What we believe is simple: connecting Lenders with payment and other credit data will bridge the multi-trillion dollar lending gap between financial institutions, private lenders and informal borrowers. Lenders can unlock the data they need to reach untapped market segments. Borrowers gain access to multiple Lenders and competitive rates. Data providers can monetize their data, now accessible to hundreds of potential Lenders. You can learn more at LendLedger.io. All payments and fees between LendLedger network participants are transacted using the LOANtoken. The digital asset interacts with smart contracts, which are neutral contracts on a blockchain that automatically administer the loan. With the power of a blockchain-based ecosystem, the LendLedger network’s loan smart contracts automatically disburse all loans and track repayment. We are committed to building a strong and active community of blockchain enthusiasts, developers, and most importantly, people that share in the LendLedger ethos. In order to prove network utility, we want to give early supporters the ability to earn stakes in LOAN assets during our bounty phases in exchange for sharing their thoughts on the project. We are committed to building a strong and active community of LendLedger participants, blockchain enthusiasts, developers, and supporters that believe in the LendLedger mission. We want to give early supporters the ability to earn stakes in LOAN assets during our bounty phases in exchange for contributing their thoughts and ideas to the project. We are allocating 1.5% of sold LOANtoken (i.e. LendLedger digital assets) for the following bounty activities, and all bounties will be distributed within 14 days of the token sale ending. Because the total number of bounty campaign participants is ever-changing, the distribution of LOANtoken will be based on a preordained amount allocated to each group listed below. We are looking for active and informed posters. Posters must have read the whitepaper to participate, and comments must be informed by the whitepaper and/or ANN post. Only constructive posts will be counted towards this campaign. We are not looking for fluff comments, e.g. “This project looks promising.” or “This is big for sports” or “Wow, good luck to the dev team.” Instead, we are looking for substantive comments - comments that move the needle either positively or constructively/critically - it’s up to you. Negative trust (Trust from DT2 or above) members are not allowed to join this campaign. 1 account per user. Any user found to have alternate accounts in the campaign will be removed and denied payment. IP checking is in effect. We don't pay for posts less than 80 characters in length. Users found to spam will be banned from the campaign and tokens will not be awarded. Posts that are poorly crafted, deemed templated or fluff will not count. Only posts in English will be counted. It is on the user to check if their links work. Any user with improper links will be disqualified and not awarded. Join now on the LendLedger BountyPortal! We will be posting all LendLedger token sale updates and co-posting every blog post on our own Twitter. Follow each page for our latest insights and share our news with your groups, friends, and followers. Your Twitter account needs to have at least 100 real followers. Retweets are limited to 3/day. Bitcointalk accounts with negative trust are not eligible. Your Twitter account needs to have at least 85% real followers, verified with https://www.twitteraudit.com/. The account must be at least 4 months old. The number of your followers is being fixed at the moment when you connect your account and doesn’t change during the campaign. Tweets must be in English. The LendLedger team is seeking talented writers who can write thoughtful, critical and introspective pieces about the LendLedger platform, our enhanced technology, and the unique features of LOANtoken. We regularly update our blog publication with resources that can be used as inspiration for content. Blog articles can be published anywhere on the internet and publicly accessible. Articles can be written in any language, but please check with us to make sure your language will qualify for a bounty. Examples of recommended publications are Forbes, Coindesk, Bitcoinist, or in any other media relevant to finances, lending, and startups. Your own blog or Medium site works, too, however you must also follow that post up with a distribution of it on Reddit. Writers should familiarize themselves with the official white papers of LendLedger to ensure accurate depiction of LendLedger and LOANtoken’s uses. Important: Add your Stellar address in the post below. Content must be unique and original and distributed widely across your social networks and platforms. For this task, bounty hunters will be rewarded for creating high quality, unique, interesting, and engaging videos about LendLedger. Video must be in English, unless otherwise approved. Sound and video quality must be high, although webcam and smartphone videos are ecceptable. Videos must be submitted for review prior to publishing publically. If we approve your content proposal, the content proposed must be created in a timely fashion and distributed widely across your social networks and platforms. The more views you accumulate, the more stakes you will be allotted. All views will be counted after the end of the campaign and will rewards its creator accordingly. to follow us on Telegram. Once you join, you must introduce yourself and post a thoughtful question to the mods or the community related to our landscape, optics, project, vision, existing business, campaigns, etc. 2. Send the bot /help to see its instructions. 3. Press the /address button to provide the bot with your Stellar address. 4. Press the/group button if you?d like to get the link to join the group yourself. 5. Press the /link button to get your unique referral URL. THIS IS WHAT YOU HAVE TO SHARE IF YOU WANT TO EARN BY INVITING! You can Review your progress by pressing the /stats button. 1. You must remain in the group until the end of the campaign. 2. You must have posted in the group at least once. 3. Being banned or leaving from the group will result to disqualification. 4. Absolutely no advertising of other projects allowed in the group. Any suggestions to to further enhance our bounty campaign? Let us know in the replies below. We appreciate it! To join the LendLedger Feedback/Advocate program and receive rewards, you must have an active Stellar-compliant wallet. A Stellar-compliant wallet supports the native asset of the Stellar network - XLM - as well as other Stellar-compliant tokens. To make this sweeter and help activate your Stellar wallet, we’re offering everyone who participates in our campaign 5 XLM for free to activate the wallet. - We'll send you 5XLM at the end of the bounty- Only if you respond back to our email which we'll send you. We’re fans of StellarTerm – it’s open source and never stores or sends your secret key anywhere. 1. In StellarTerm, click ‘New Account’ in the top menu. b. Click ‘Generate keypair’ where you will be shown a Public Key and a Secret Key. NOTE: This Secret Key is the password to your account. If lost, it cannot be recovered. We recommend printing the Keypair and storing it safely so no one can use it to steal your tokens. 2. Log into your Wallet using your Secret Key. Great! You are now ready to participate in the LendLedger Bounty Program! But you cannot receive LOAN tokens until you complete steps 3 and 4 below. To activate your wallet, you will need to fund it with at least 5 Lumens (XLM). You can do this yourself by buying Lumens on an exchange and sending it to your public wallet key address. OR, YOU CAN HAVE OUR LUMENS! LendLedger will send bounty participants 5 FREE XLM to activate wallets, once bounty activities have been completed. To be able to receive LOANtokens, your wallet must add a “Trustline” to LendLedger. b. Log into StellarTerm using your Secret Key. Note: The LendLedger logo and Issuer name will not display. They will only be verified after LOANtokens have been listed in the Stellar Decentralized Exchange (SDX). This will happen after the token sale. If you interested, please send me PM on my bitcointalk profile. your airdropbot is not working. in social media only twitter campaign are available? Thank you- Dont forget to get stellar address because its a stellar based project. Nope! No need to report your task here. Most lucrative bounty campaign is up and running. 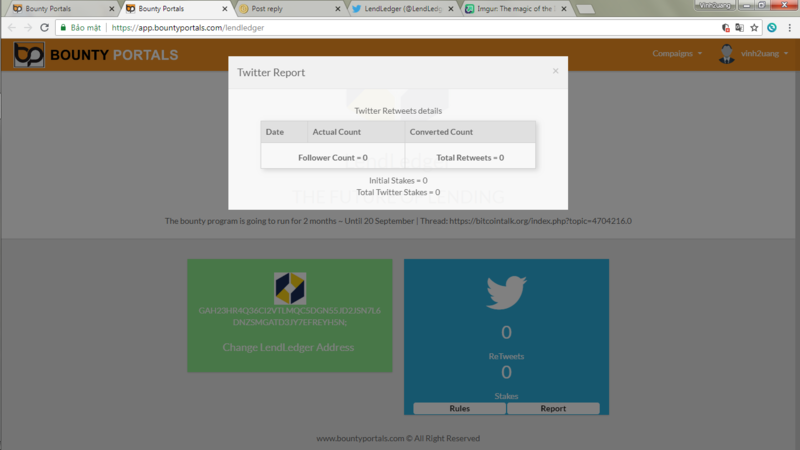 I retweeted 3 days but the system did not count my retweets in the LendLedger campaign. Other campaigns have no problems. Same problem! WTF, BM??? Bounty is not active or what?